Logan had his 15 month old checkup last week, which Marty took him to since I was working. He's 24lbs and 32.5 inches tall. I swear he gets more and more fun with each passing day, suprising me with what he picks up on and what he can do. And he has, curly-ish hair? Only when it's humid and warmer - we didn't see this last summer as he didn't have much hair, but when we took him to Florida it got pretty curly. 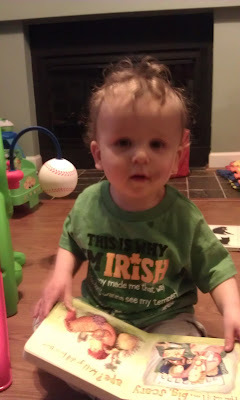 I don't know if this will stay or if he will end up having wavy hair like his dad. Probably, since he seems to be a carbon copy of Marty right now (also, the bruise on his cheek is due to a fall into the corner of a table at daycare). Do not be alarmed by the next picture of Marty and his sister - I just wanted to illustrate that when he had hair it was not straight. My hair was always stick straight, but is sort of wavy like now after having Logan. So weird what pregancy can change in you. But it's not like it's a nice wavy, it's just sort of mangy wavy and if I blow it dry it will be nice and straight - unless it's humid where it will then turn yuck again. And let's face it, I live in the south and humidity is part of daily life. So that's one good thing about the winter. Nicer hair. But back to Logan. His favorite words right now are 'dog' and 'ball' and he has also recently started saying "choo choo" (really, 'too too') when the train goes by. We live near a set of tracks, so this is a couple of times a day. He also has been saying 'shoes' (again, more like 'tooos'), but hey, he's trying. And it's adorable. 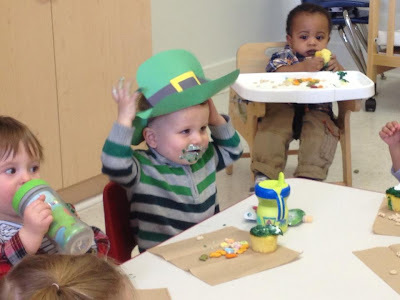 Marty and I went to his St. Patrick's day party at daycare and it was fun watching them all eat green cupcakes and get so messy. We're both amazed at how the teachers can get the kids to sit so obediently at the table and eat without any fuss. When we walked in, Logan got out of his chair and ran over to us so he could give us both hugs, then he went back to the table. Sit on side of pool. Vroom vroom to side to get out. 20-25 minute in water, all good, locker room was freezing though. He does not like shower right now. Logan is such a cutie Bri. You guys must have so much fun every day! 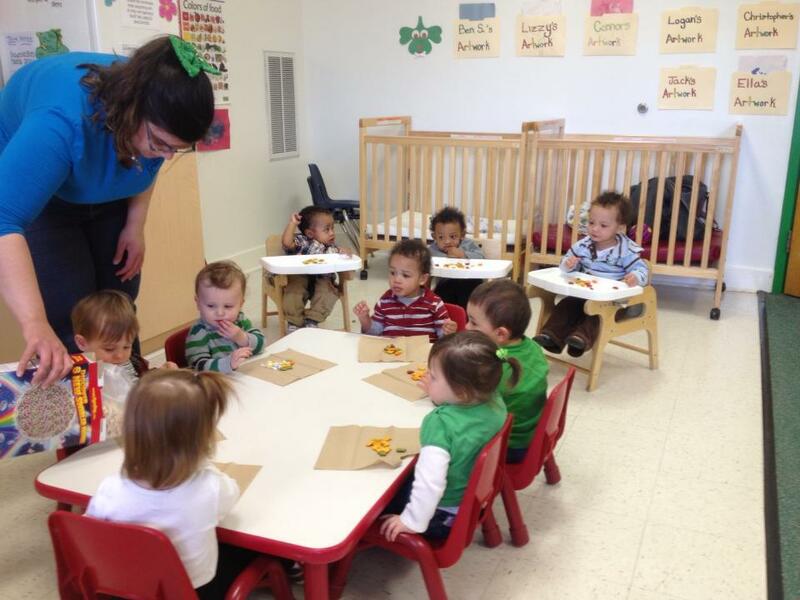 Aren't daycare teachers amazing with what they can get a group of kids to do? And my hair did the same thing - and it got worse with the second pregnancy. My super straight easy to deal with hair is gone. Isn't 15 months so fun! Honestly with Zach because he was pretty verbal it just kept getting better - terrible twos weren't bad - I'll keep my fingers crossed that with both Logan and Landon that ends up being true.